A.L. West: Texas clinched the division with its win over Seattle and the Angels’ loss to Oakland. N.L. Central: Milwaukee clinched the division with a win over Florida and St. Louis’ loss to the Chicago Cubs. N.L. West: Arizona clinched the division by defeating San Francisco. 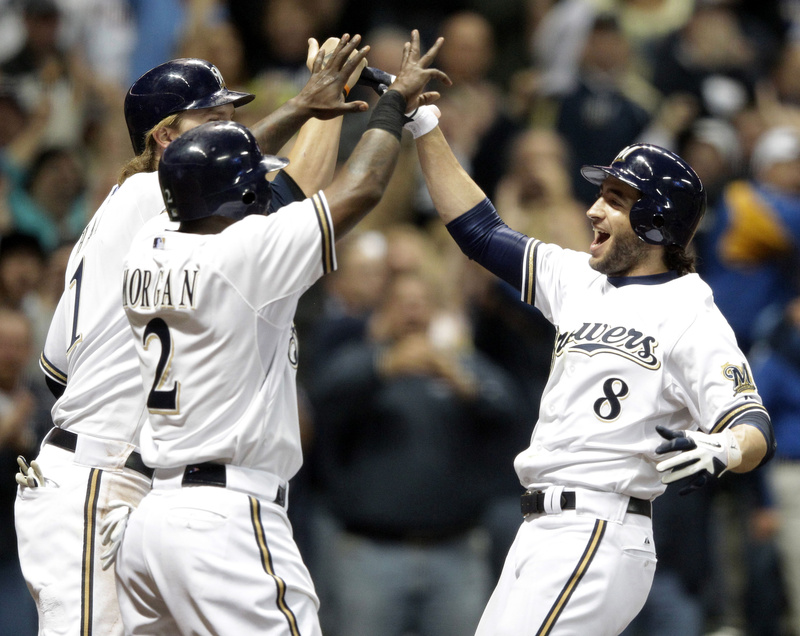 Ryan Braun stepped into the box when a familiar feeling overcame him. Just like in 2008, the Brewers’ homegrown slugger propelled Milwaukee back into the postseason. Braun hit a three-run, go-ahead homer in the eighth with chants of “M-V-P” ringing throughout the sellout crowd and the Milwaukee Brewers beat the Florida Marlins 4-1 on Friday night to win their first division title since 1982. Milwaukee clinched the N.L. Central after waiting 20 minutes for the Cubs to finish off their 5-1 win over the Cardinals. Braun’s home run was reminiscent of his 2008 homer on the last day of the season that lifted Milwaukee to the wild card and its first postseason appearance since winning the A.L. East in 1982. Now, they’re back – as division champs. Attorneys for Major League Baseball asked a Delaware bankruptcy judge to clear the way for a sale of the Los Angeles Dodgers, saying team owner Frank McCourt is driving the team to destruction. Attorneys for the league argued in a court filing that McCourt has methodically stripped the team of its revenue sources and is seeking to auction off the team’s television rights without league approval, which could lead to its expulsion from the league. Braves right-handed starter Tommy Hanson felt pain in his right shoulder blade during a rehab appearance in Florida and was shut down after two innings, one fewer than he was scheduled to throw. He will try to throw a side session in a few days. … Florida closer Leo Nunez admitted to using fake documents and a fake ID to sign a pro contract more than a year ago. … Former Detroit pitcher Denny McLain was arrested at the Michigan border with Canada on a fugitive fraud warrant issued in Louisiana. The alleged fraud involved more than $1,500 in unpaid scrap metal or scrap iron delivered to his Louisiana business.